He saw and he believed. The day begins with darkness and fear. The tomb has been desecrated. The body has been stolen. Whatever Jesus said about resurrection, his disciples did not expect him to rise until the general resurrection of the dead at the end of time. The anonymous disciple loved by Jesus races to the tomb, sees the linen cloth and the face cloth placed apart and believes. In this simple sign of a ‘tidy’ tomb, he sees what Peter missed, that God has entered this story of death and transformed it to a story of life. On two occasions in this short reading, we find the use of the passive voice – ‘the stone had been moved away’ and the linen cloth over his head, ‘rolled up’ in a place by itself. Frequently in the Scriptures, the use of the passive voice is called the Divine Passive, as it is a way of referring to the action of God without naming God as the direct agent of the action. This is a Semitic way of reverencing God. The face-veil has been removed and rolled with care. Although never named, God is the Divine agent in this episode. John’s Easter story is closer to our real experience than many of the other Resurrection stories. Here we have no angels announcing ‘He is raised’; no Jesus present to change sadness into joy. Resurrection is more subtle in this Gospel. Mary and Peter miss the signs. They remain locked in grief still carrying the painful burden of Golgotha. It is the disciple named ‘beloved’ who first experiences resurrection in his openness to believe in God’s power to raise Jesus. Easter calls for faith. Those who know the loss and pain of death know too well the hard, long search to find signs of life. We don’t experience a sudden glorious moment of life returned. Like the anonymous disciple, we often stay some time within the tomb before finding grace to turn and enter into life. Such grace is found in simple signs of a love that does endure. Perhaps this is why ‘the beloved’ disciple first reaches Easter faith. 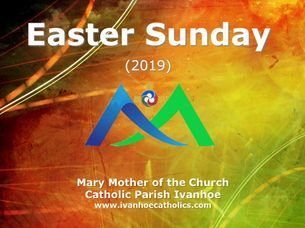 Naming this day as ‘the first day’ of the week, is not simply an indicator that it is the day of the Jewish Sabbath (7th day), but is also a hint that in John’s Gospel the resurrection is the dawn of a new creation. If you recall the Passion reading on Friday, which is always from John’s gospel, you might have noticed that Jesus was arrested in a garden, and then was buried in a garden. We so frequently mix all the gospel accounts together we can sometimes miss seeing the unique theological vision and artistry of each individual evangelist. Only John has Jesus arrested in a garden, and only John has Jesus buried in a garden. Also John emphasises that the Cross is placed ‘in the middle’ which is the same phrase used to describe the tree of life in Genesis 2, which was also placed ‘in the middle of the garden’. Then at the foot of the Cross John has a man and a woman, who is only called ‘woman’ and ‘mother’ in this Gospel. These were the names given to Eve. These differences to the Synoptic gospels are deliberate. John is setting the crucifixion within the garden of creation. For John, the cross marks the end of one creation – remember Jesus’ words, ‘It is finished’ – and the beginning of a new creation. In Paul’s letter to the Colossians, a similar theology is presented, that the resurrection is a new creation. Paul speaks about being ‘brought back to true life’ and reminds the Colossians that ‘you have died’. For both Paul and John, the Christ event has an impact on all people and in fact all of creation. The old creation, the old life is now finished and a new possibility of life has been revealed and this is God’s own eternity life, which humans can participate in. Jesus is the sign that humanity has passed through death and that humanity can be imbued with God’s divine life, what Paul calls ‘glory’ in this passage. So Resurrection is not just a celebration for what happened to Jesus – if it were only that, then Easter would be just a nostalgic memory. Easter celebrates that we also, right now, through the Risen One, can participate in Divine life. So Easter is as much about us, as it is about Jesus. You may have had a chance to see the film, ‘As it is in heaven,’ which suggests that through music, a group of people for a short time were able to glimpse or hear the divine harmony. For a moment, they participated in something bigger than themselves. Easter is this glimpse for us of heaven on earth.